AFTER the crop circle has come the almost obligatory UFO sighting. 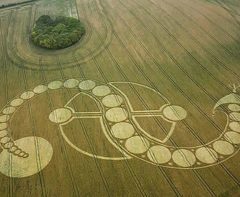 This spectacular formation appeared overnight on July 28 in a field at West Woodhay. It immediately attracted hundreds of sightseers and simultaneously earned the ire of landowner Harry Henderson, who dismissed it as the work of trespassers. But even those artists who lay claim to some of the designs that appear in the fields each year have seen strange lights associated with the formations. Now Newbury businesswoman Bonni Southey has reported unexplained light phenomena after she decided to visit the area. She said: “We were having a look to see if the crop circle was still there. Looking across to the horizon above and to the right of the crop circle formation we saw first one bright, static light, which then disappeared and re-appeared again about two miles away in a matter of seconds. Those who oppose a purely mundane explanation for at least some of the designs point to intricate ‘weaving’ of the cereal; to bent but unbroken stalks even in brittle crops, to apparent changes at the cellular level and to the fact that in 1991 an intricate design appeared outside the then Prime Minister John Major’s country residence, despite the fact that the field is a maximum security zone patrolled 24-hours a day. The West Woodhay formation, dubbed the cosmic serpent by enthusiasts, spans 11 tractor tram lines and is one of the largest ever seen in the UK. Last month Physics World magazine speculated that the designs are possibly created using microwaves generated by a device called a magnetron, directed by GPS satellite.